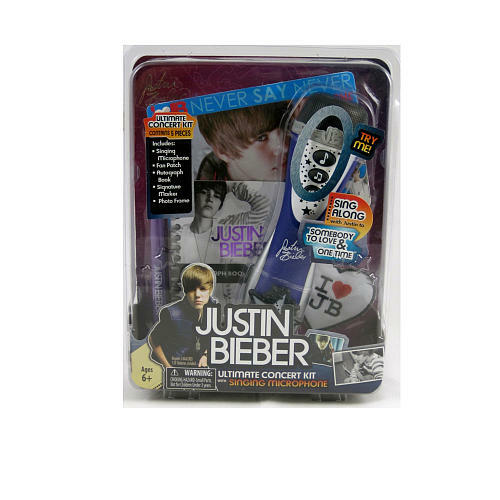 My Family Fun - Justin Bieber Concert Kit Microphone with concert-inspired accessories! Home videos made him an online phenomenon, and now he’s an international superstar. Justin Bieber dominates the charts and captures girls hearts with his catchy songs and signature style. Now you can get the in-concert experience with this singing microphone with concert-inspired accessories, Justin Bieber Concert Kit. Microphone plays 30-second clips of "One Time" and "Somebody to Love" plus 2 concert sound effects. You also get an autograph book and marker, Justin Bieber photo frame, and signature embroidered patch.